INSPECTION: JUNE 20TH from 9:00 am to 4:00 pm. 31” and 20” Rotary Tables. Tooling Fixture Blocks (2) 31” x 74” x 29 ½”, 22” x 62” x 29 ½”. Drills, Taps, Reamers, Radius and Key-Slot Cutters. (2) Vidmar 10-Drawer Tooling Cabinet. 2001 Isuzu V8 EFI 12’ Stake Bed Truck Lisc# 6V66728 w/ Gas Engine, Automatic Trans, 242,167 Miles,VIN# 4KLC4B1R01J804398. Cantilever and Vertical Material Racks. Sheffield Cordax 1808-mm CMM Machine s/n C-6163- 0490 w/ Sheffield 3-Axis Programmable DRO,Renishaw PH-8 Probe, 37” x 104” Granite Table, Approx 18” x 80” x 18” Work Envelope, Computer. Mitutoyo PH-A14 14” Optical Comparator s/n 009481301 w/ Mitutoyo KA Counter Programmable DRO,Surface and Profile Illumination, 6” x 16” Table. Wilson mdl. 3OUR Rockwell Hardness Tester s/n 702. (2) 12” Dial Height Gages. (3) 6” x 6” Sine Tables. Mitutoyo and Fowler Dial Bore Gages. Mitutoyo and Starrett 40” Vernier Calipers. Mojave 72” x 144” x 16” 2-Ledge Granite Surface Plate w/ Stand. Starrett Crystal Pink 48” x 96” x 12” 2-Ledge Grade “A” Granite Surface Plate w/ Stand. 36” x 60” x 8 ½” Granite Surface Plate w/Stand. Mojave 36” x 48” x 6 ½” Granite Surface Plate w/ Stand. Precision 18” x 24” x 3” Granite Surface Plate w/ Cabinet Base. LeBlond 25” Sliding-Gap Gap Bed Lathe s/n N11244 w/ 200” Slide Expansion, 5-600 RPM, Taper Attachment, Inch Threading, Tailstock, Steady Rest, KDK Tool Post, 24” 4-Jaw Chuck. Lyon C10MB 22” x 126” Geared Head Gap Bed Lathe s/n 10900 w/ 16-2000 RPM, Taper Attachment, Inch/mm Threading, Tailstock, 2 ¾” Thru Spindle Bore, KDK Tool Post, 12” 3-Jaw Chuck. Namseon Webb “Mecca Turn 16 x 40” 16” x 40” Geared Head Gap Bed Lathe s/n S100001-001 w/ 30- 2000 RPM, Inch/mm Threading, Tailstock, Steady Rest, KDK Tool Post, 10” 3-Jaw Chuck. Bridgeport Series 1 – 2Hp Vertical Mill s/n 249925 w/ Sony Millman DRO, 60-4200 Dial RPM, Chrome Ways, 7” Riser, 9” x 42” Table. Bridgeport Series 1 – 2HP Vertical Mill s/n 249943 w/ Sony Millman DRO, 60-4200 Dial RPM, Chrome Ways, 9” x 42” Table. Bridgeport Series 1 – 2Hp Vertical Mill s/n 246667 w/ Sony Millman DRO, 60-4200 Dial RPM, Chrome,Ways, 9” x 42” Table. Bridgeport Series 1 – 2Hp Vertical Mill s/n 245698 w/ Sony Millman DRO, 60-4200 Dial RPM, Chrome, Ways, 9” x 42” Table. Bridgeport Series 1 – 2Hp Vertical Mill s/n 235524 w/ Sony Millman DRO, 60-4200 Dial RPM, Chrome Ways, 9” x 42” Table. Bridgeport Vertical Mill s/n 233729 w/ Magnascale LH70-2 Programmable DRO, 2Hp Motor, 60-4200 Dial RPM, Chrome Ways, Power Feed, 9” x 42” Table. Ganesh Deluxe GMV-1 Vertical Mill s/n E13393 w/ Fagor Innova DRO, 3Hp Motor, 60-4200 Dial RPM, Chrome Ways, Power Feed, 9” x 42” Table. Tree 2UVR Vertical Mill s/n 10724 w/ Sony, Millman DRO, 60-3300 RPM, Colleted Spindle, Power Feeds, 10 ½” x 42” Table. 2007 Haas VF-2D CNC Vertical Machining Center s/n 1063579 w/ Haas Controls, 20-Station ATC, CAT-40 Taper Spindle, 20Hp Vector Dual Drive, 7500 RPM, Baldor Spindle Motor, Rigid Tapping, USB, Advanced Tool Management, Coolant. TMG RE-1MVL CNC Vertical Machining Center s/n N86D-0334 w/ Fanuc Series 6M Controls, 28-Station ATC, CAT-50 Taper Spindle, 29 ½” x 82 ½” Table, Coolant. Ooya RE-1MVL CNC Vertical Machining Center s/n VL2110022 w/ Fanuc 11M Controls, 36-Station ATC, CAT-45 Taper Spindle, 23 ½” x 82 ½” Table, Coolant. Ooya RE-1MVL CNC Vertical Machining Center s/n VL2111024 w/ Fanuc 11M Controls, 36-Station ATC, CAT-45 Taper Spindle, 23 ½” x 82 ½” Table, Coolant. Bridgeport / ProtoTrak 2-Axis CNC Vertical Mill s/n 271650 w/ ProtoTrak EMX Controls, 2Hp Motor, 60-4200 Dial RPM, Chrome Ways, 4” Riser, 9” x 48” Table. Okuma LH35-N CNC Lathe s/n s/n 58.1-1867 w/ Okuma OSP5000L Controls, 6-Station Turning Turret, 4-Position Turning/Boring Head, Tailstock, 15” 3-Jaw Chuck, Coolant. Miller CP-302 CV-DC Arc Welding Power Source s/n LC456264 w/ Miller 22A Wire Feeder. Miller CP-300 CV-DC Arc Welding Power Source s/n KA824066 w/ Miller S-52A Wire Feeder. Lincoln Idealarc TM-300/300 AC/DC Arc Welding Power Source. Hobart MEGA-MIG 300RVS MIG Welding Power Source s/n 81WS20892 w/ MK Cobramatic MIG Welder Feeder. Hypertherm PowerMAX 45 Plasma Cutting Power Source. Irco mdl. 10K 12X12 Compound Motorized Welding Positioner w/ 48” x 48” Table. 84” x 108” T-Slot Forming Table. 49” x 100” Acorn Style Forming Table. (2) 49” Dia. Welding Tables. (2) Henkel mdl. R-450 Electrode Stabilization Ovens. Phoenix Dry Rod Type 300 Electrode Stabilization Oven. Tominaga / YMG RH-1225 12” Column x 36” Radial Arm Drill s/n 80120 w/ 90-2010 RPM, Power Column and Feeds, 29” x 52” Table Area. Marvel Series 8 MARK II 18” Vertical Miter Band Saw w/ Manual Clamping, 45 Degree Miter Capab. DoAll 2013-20 20” Vertical Band Saw s/n 377-80535 w/ Blade Welder, 0-5200 Dial FPM, 26” x 26” MiterTable. W.F. Wells mdl. L-10 10” Horizontal Band Saw s/n L991121 w/ 100-300 Dial FPM, Manual Clamping,Coolant. IMC mdl. 2504 25Hp Rotary Vane Air Compressor. Ingersoll Rand T30 20Hp Horizontal Air Compressor w/ 120 Gallon Tank. Ingersoll Rand 20Hp Horizontal Air Compressor w/ 120 Gallon Tank. Magnolia 10Hp Horizontal Air Compressor w/ 80 Gallon Tank. Central Pneumatics Dry Blast Cabinet.Flex-Arm Pneumatic Straight Hole Tapper w/ 50” Dia. Table. Greenerd No. 4 Arbor Press w/ Stand, Speed Wheel. 2012 Toshiba BP-150.R22 CNC Horizontal Boring Mill s/n 421541 w/ Tosnuc 999 Controls, 60-Station ATC, CAT-50 Taper Spindle, 6” Spindle, 70.9” x 86.6” Table Indexable @ 90 Degrees, 7717 ON Hours, 2066 Spindle Hours, 1565 Cutting Hours. 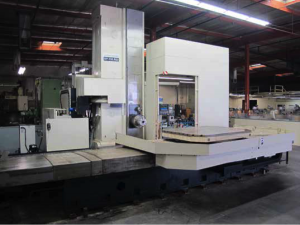 DeVlieg Spiramatic 65K-144 4-Axis CNC Horizontal Boring Mill s/n 4935 w/ Fanuc Series 16-M Controls, Hand Wheel, 10-1800 RPM, 6” Spindle, 50-Taper Spindle, 60” x 144” Table, 50” x 72” 4 th Axis Rotary Table. Shibaura BTD-11B CNC Horizontal Boring Mill s/n 173663 w/ MSTech 800U Controls, 5-1000 RPM, 4 ½” Spindle, 50-Taper Spindle, Travels X=51”, Y=78”, Z=59”, 24.5” Spindle Extension, Auto Indexing Table @ 90 Degrees, 55” x 63” Table. Shibaura TSN-13A CNC Vertical Boring Mill s/n 410107 w/ Fanuc System 6T Controls, 49” Chuck, 67” Max Swing. Shibaura BT-10BR3PD Horizontal Boring Mill s/n 123451 w/ Acu-Rite 3-Axis Programmable DRO, 20-1000 RPM, 4” Spindle, 50-Taper Spindle, Power Feeds, 55” x 63” Indexing Table, Bridgeport “J” Milling Head with 1.5Hp Motor, 60-4200 Dial RPM, Custom Adaptor Plate. Shibaura BT-10BR3PD Horizontal Boring Mill s/n 123650 w/ Anilam Wizard 3-Axis DRO, 20-1000 RPM, 4” Spindle, 50-Taper Spindle, Power Feeds, 55” x 63” Indexing Table. Berthiez BM225 Open Sided Vertical Boring Mill s/n 200232-NW w/0-125 RPM, Tracing Attachment, 88 ½” Chuck, 152” Max Swing. Shibaura TX16 Twin Head Vertical Turret Lathe s/n 320237 w/ Anilam Wizard550 DRO, 5-Station Turret Head, Facing/Boring Head, Inch Threading, 63” Chuck, 86” Max Swing. Webster &amp; Bennette 36” Vertical Turret Lathe s/n 610553 w/ 13.5-300 RPM, 5-Station Turret, 36” Chuck, 50” Swing.